Ajax Downs is a Quarter Horse race track located in Ajax, Ontario, Canada. In 2009, a new state of the art race track was installed. It runs five-eighths of a mile and should reduce injuries among the race horses. 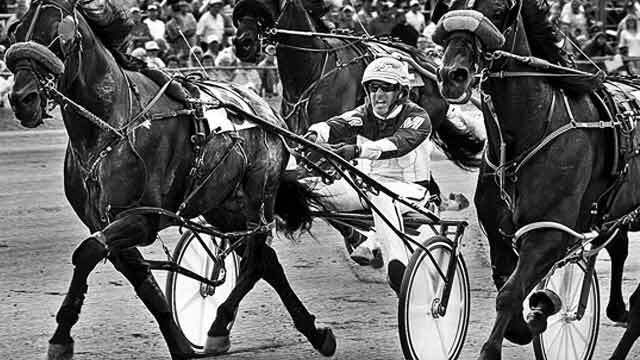 In 1969, Ukrainian-immigrant, Alex Picov, opened his quarter horse race track. Nine years later, he opened a new horse complex in Ajax, called a J-track. It's still a family business and Mr. Picov's grandson, Justin Picov, was in charge of constructing the new elliptical track which runs five-eighths of a mile. It's state of the art and should reduce injuries among the race horses. It also allows for races of different distances so fans get a higher quality race. Instead of a 12 second race, now fans can see a 30-second race. In addition to the new track, there are two big screens for fans to follow the races and outdoor grandstands that can seat up to 800 people. The renovations were estimated to cost $5 million. The track's catchphrase is, 'Catch the excitement and feel the speed' and Picov believes that going to the races can be fun for the family. With the paddock where the horses are saddled right beside the grandstand, families can feel like they're part of the action. The facility hosts special-event days and barbecues that cater to families as well. In addition to fun for the public, Mr. Picov said the new track means about 300 agricultural jobs in the area including jobs at the track and in raising horses.